Figuratively speaking, last weekend was my first time in Rwanda; considering that I had only ever been there (multiple times) for “business”. This time, I boarded the bus that took me to Kigali with nothing else on my mind than to enjoy myself… The best part is that I was with 4 of my boys… Best (though short) break ever! All the other times I had been to Kigali before, I had been rolling on my parents’ or taxpayers’ (don’t shoot me!) money – meaning that I cared less about my spending patterns. I never actually realised how expensive the city is until last weekend. The cheapest meal (drinks not included) I think we had (excluding breakfasts) cost 3000 FRW – and it wasn’t even in a posh place (I didn’t set foot in a Bourbon) – which is equivalent to 7,800 FBU, and that’s quite high! Overall, I survived a Friday night, a Saturday and a Sunday morning on a budget of about 100,000 FRW (260,000 FBU), return bus ticket included – although using the term “survived” may not be appropriate, as I indulged myself in few luxuries like renting a car for two days (30,000 FRW, fuel included), and the 3D and 5D Cinema experiences (9,500 FRW, just for the tickets). Please note that I shared my 15,000 FRW (without breakfast) room with a friend, that I did not do any shopping and that I did not engage in any (excessive) consumption of alcohol activity. I’ve been hearing people claim that Rwandans cannot freely express themselves, so how can you explain to me that on the night we got there, we witnessed two (apparently mature) guys kissing in the middle of a busy street? I promise you, I am not lying! I have witnesses! It was somewhere in Remera. I’m not speaking of long passionate kisses, just random multiple pecks on the lips… Like the guys were speaking and just out of nowhere they would just *smack*… My friends and I were like O_O … Or maybe it’s a Rwandan thing for men to occasionally kiss on the lips? No? Just asking! Too many beautiful women than the mind can bear! I refuse to swallow my pride and say that Rwanda has more beautiful women than Burundi… My buddy and I actually managed to convince ourselves that Burundi’s beautiful women prefer to stay indoors… Rwanda’s beautiful women just happen to go out a lot. Voilà! Oh, did I mention the whole purpose of the trip was to celebrate (I may be using the wrong term) the end of my buddy’s bachelorhood? -Beautiful Rwandair ticketing agent: So are you or are you not going to pay?! –The B Man: (with a very calm voice) isn’t it a shame that the words that come out of your mouth aren’t as beautiful as you are? As I sipped on my (expensive) milkshake, after awesome 3D and 5D movie experiences, I remembered my ‘Just another bunch of elites’ post and realised that ‘super cities’ aren’t totally bad idea after all. I found it hard to believe I was just a few hours away from Burundi, thanks to the first World experiences I was enjoying. 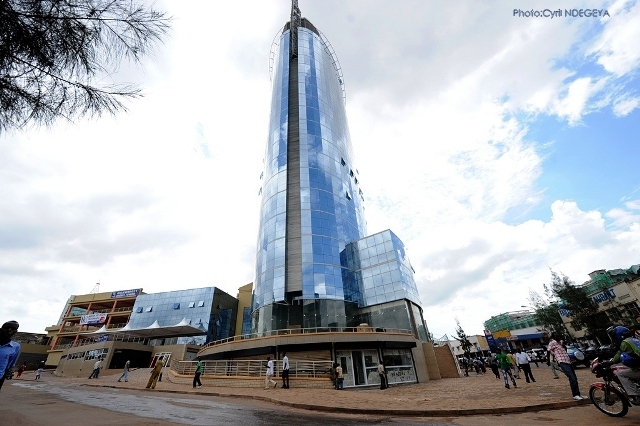 I realised that structures and facilities like the Kigali City Tower mall give elites, expats and foreign investors a sense of comfort and security that keeps them and their money inland, meaning that they are more likely to invest in other development projects! Thank you Kigali for opening my eyes! … Speaking of milkshakes and malls, I burst out laughing when 5 waiters invaded us with 5 different menus when we arrived at KCT food court; and in my opinion, Bourbon and this other place in Kacyiru (I don’t remember the name; I’ve only been there once some time ago) serve the best milkshakes in town. Voilà… and I didn’t even speak of the time we got stopped by the police for driving a car with a broken headlight (we hadn’t noticed)… or how we got lost… or about the Museums and memorial we didn’t visit simply because we didn’t have enough time… You’re going to have to discover them yourself! ← I am NOT a Patriot!